Chi Chi Chi, Le Le Le. los mineros de chile !!!!!!!!! Chi Chi Chi, Le Le Le. Chile miners !!!!!!!!! The end of this incredible story, all the miners and rescuers Copiapo who had descended to help and are on the surface. 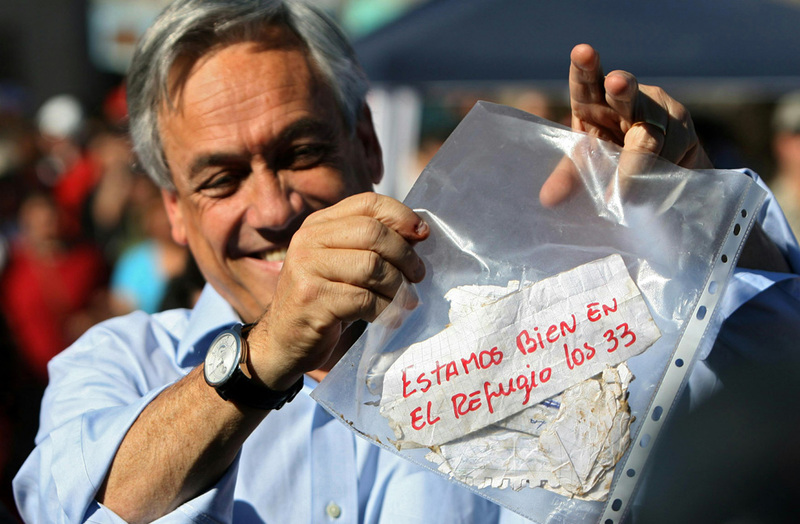 Work performed, the work hard, with courage, faith, had their success, the 33 men on August 5 had been under 700 in the San Jose Island in Chile, ended up leaving. Thousands of people did their best, worked untiring to conduct the drilling, so that the capsule Phoenix, one by one they were up and reunite with their families, who were given the revival of that 32 Chilean and 1 boliviano. What can be said in times like this, who are believers know that God was with her protective mantle protecting these 33 men and those who participated in the rescue, all of whom in one way and another part to perform the extraction, working hours and hours without stopping that example of solidarity, cooperation, this ends up being the highlight of it all. The joy, tears of excitement, nerves, all that has happened and is now just the teaching of all this: that SOLIDARITY, to think about the common good is the most important and that each of us should know, remember and pass. The extraction of the miners of Chile is being conducted from the early hours of Wednesday, and 16 miners are rescued, moments of emotion, of joy, faith, madness, they have been. Different reactions to reach the surface, but each of them wonderful, because each of these increases is a new life rescues, which has been saved. What a wonderful madness Mario Sepulveda, their gifts of a rock that rose to the surface, his jumping wildly, his cries, the lecture he gave, citing the safety issue of mining work and respect for the family saying before making a mistake a man or woman should think of your partner, the love you have and the most incredible up asking for his dog as it was. The rise of Mario Gomez, the largest of the miners, which was who had more fears for his health, the kiss he gave his wife, the love that is lavished on a man who for 12 years working in mines, and so 16 stories of those who have already gone up, the reception, the happiness of each of the people who are waiting, who have worked in this rescue. All the 16 men who have risen to great, some better health, which you can tell those two months of imprisonment under 700 meters underground, but all with a wonderful value, although there are 17 men still in the mine, God be with you and they continue to hold high the faith, and above all the feeling of Unity, Solidarity, companionship, which is what kept them alive and allowed them to get ahead, never forgetting that UNITY AND RESPECT FOR LIFE, living apart the selfish feeling is what allows humans to achieve wonderful goals and overcoming every day. You Chile, you can, all the town has done a wonderful job. And as you scream Chi-chi-chi-chileeeeeee! The time has come, today is the extraction of the 33 miners, 32 miners from Chile and a Bolivian, who have 2 months and 7 days, from August 5, 2010, when a collapse to 400 meters depth San José copper left in 700 meters of land to the 33 men, after the collapse of the bury. With the active forces in Chile, aid from foreign countries and each of the people who put their effort today from the bowels of mother earth, reborn, the light will go on to reunite with their families, their fellow citizens, with a world whole waiting for them. The miracle has happened, when the collapse occurred, could reach the area to guard each mine must have for safety, where there is food, oxygen, and survived. Those who believe in God, believe that his superior strength to help both the rescuers, who have worked hard to get where they were miners, as those men, who have kept their faith intact, its value, which have formed a solidarity group knowing that they did not survive but that the force was in the drive. Who is a believer, pick up a prayer, which is not that positive thinking, and knowing what is empathy, put yourself in another, send their forces for this revival, is carried out smoothly and the best way possible. The people of Chile, the Bolivian people, who have faith, fight, and this is just the beginning of the union of peoples. For families, this one more like the family, that faith, that gives the go days and days in the camp hope, is only a symbol of family togetherness, of family love. Those who have participated in some form or another in the rescue, work hard to remove the 33 miners, thanks for everything you have done, also the knowledge that the worker helping another worker achieves the greatest things. And what about those 33 men, who are men, people of great worth, which have done their best and not tainted by human meanness, but have shown that man still has values, and the understanding the good of others is the good of their own, demonstrated what is solidarity, which is a united group, and what it achieves a set of men instead of thinking about themselves think about the other. 1. Urzua Luis Iribarren (54) .- Surveyor, shift supervisor and natural leader, took over the 17 days they were waiting for rescuers located them. Brings 31 years of mining, but only two in the San Jose site. He has two children. 2. Florencio Avalos (31) .– Married with two children. It’s foreman, the second in command. 3. Renan Avalos (29) .- Single and childless, his face was the first of the trapped miners who saw the world. 4. Samuel Avalos Acuña (43) .– got the job at the mine with the help of his brother, Renan, but what really likes the trade. He has three children. 5. Araya Osman (30) .– Married with three children, had only four months working at the mine and had in mind to change jobs because he considered that the site was not safe. 6. Carlos Bugueño (27) .– Before entering the mine, was the security guard, but he wanted to buy a house and a car. 7. 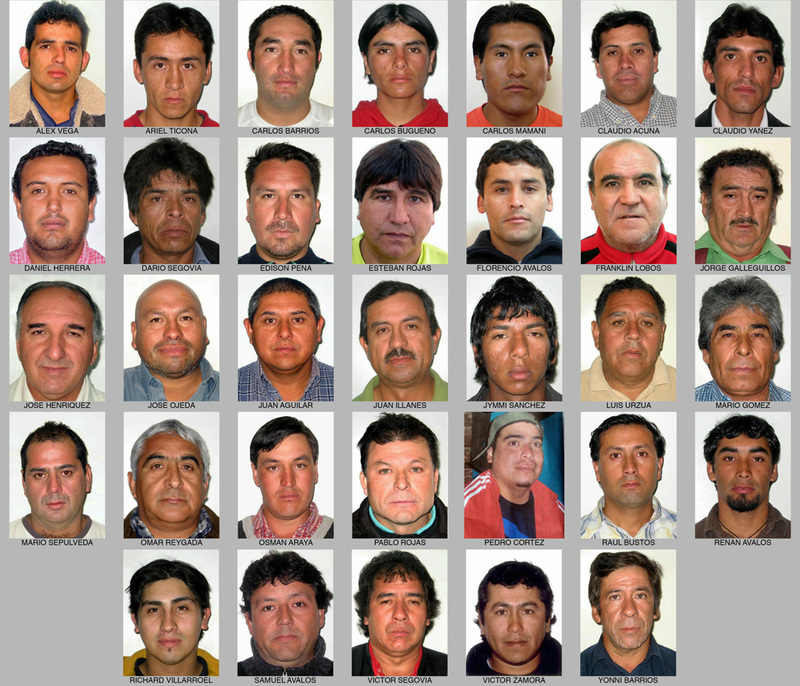 Pedro Cortez (26) .– Separated and a girl, is an electrician, but got a miner driven by his friend Carlos Bugueño. 8. Carlos Barrios (27) .– With a five year old son, his girfriend found out she was pregnant a month a week after the collapse. 9. Yonny Barrios (50) .– RN, is in charge of giving injections and write the medical reports of their peers and give them the rescue team. 10. Victor Rojas Segovia (48) .– Driller, married with five daughters. Write everything that happens in the refuge from the day of the collapse. His intention is to publish a book when he leave. 11. Darío Segovia (48) .– With thirteen brothers and six children, spent three months at the mine and wanted to put a grocery store. He said the mine wept much, because stones fell off. 12. Mario Sepulveda (39) .– Married with two children, one who brightens up the videos recorded during the captivity and shows the world how to live in the shelter. 13. Franklin Lobos (52) .– Ex professional footballer, played for first division teams like Everton, where he met Ivan Zamorano. 14. Jorge Gallardo (56) .– Driller passionate about mining, which worked since age 16, has a large collection of rocks and minerals. 15. Victor Zamora (33) .– Dubbed as “The Poet” because he wrote poems to his wife. He has a son and I hope other. 16. Jimmy Sanchez (19) .– The younger, the father of a girl of three months. I wanted to get another job to study at night. 17. Omar Reygadas (56) .– Father of five children, in his thirty years as a miner is trapped on three occasions. 18. Ariel Ticona (29) .– Driver of heavy machinery, has two sons and a daughter who was born during his imprisonment in the field to which his wife gave him the name of Hope. 19. Claudio Yáñez Lagos (34) .– Two daughters, had only eight months in the mine. He sits down to take turns with each of his teammates. 20. Pablo Rojas Villacorta (45) .– Charger explosives, married with a son, 21, had spent six months working in the San Jose site. 21. Juan Carlos Aguilar (49) .– He has two children and has 19 years as a miner. 22. Juan Illanes (52) .– Former member, was tired of the harshness of the mine and wanted to buy a taxi to work in his native Chillán. 23. Richard Villarroel (26) .– It will be father soon. 24. Raul Bustos (40) .– Mechanical, worked at the shipyard in Talcahuano, but after the earthquake of February 27 and decided to migrate north looking for work in the mine. 25. José Henríquez (56) .– Married with two daughters, and exercises are evangelical group’s spiritual guide. 26. 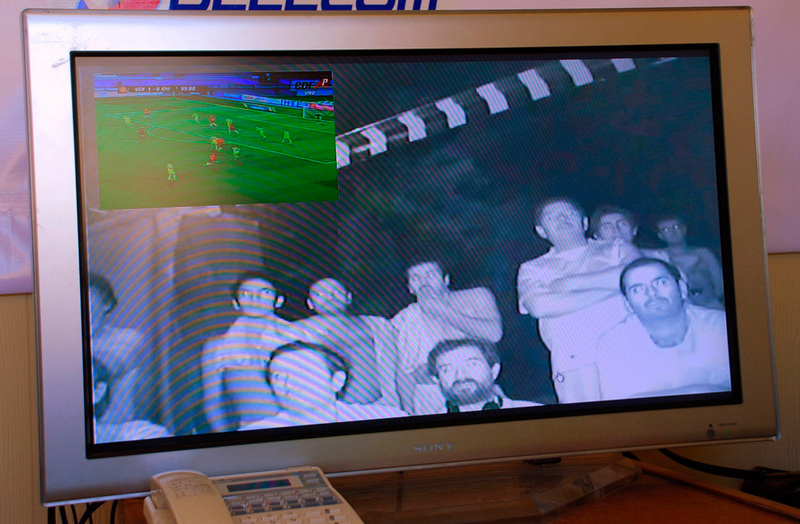 Alex Vega (31) .– Mechanical, father of two, wanted to save to buy a house in Copiapo. 27. Daniel Herrera (27) .– driver and follower of Audax Italiano, received a shirt signed by all players. 28. Mario Gomez (63) .– Conductor, leads from the twelve years working as a miner. Sent the first letter describing the coordinates of the shelter. He has escaped several accidents, but is missing three fingers of one hand. 29. 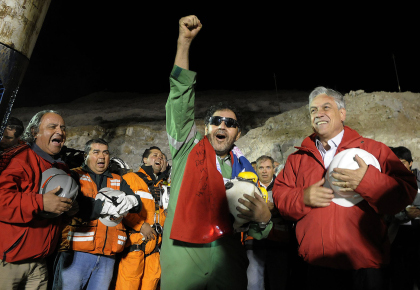 Carlos Mamani (24) .– Bolivia, the only foreigner in the 33 trapped miners. He is the father of a child. 32. Claudio Acuña (34) .– Driller, asked him to marry his girlfriend from the bottom of the mine. 33. Edison Villarroel Peña (34) .– sports fan, runs 10 miles a day inside the mine. El momento ha llegado, hoy se hace la extraccion de los 33 mineros, 32 mineros de chile y 1 boliviano, que llevan 2 meses y 7 dias, desde el 5 de agosto de 2010, en que un derrumbe a 400 metros de profundidad en la cuprífera San José dejo bajo 700 metros de tierra a los 33 hombres,luego que el derrumbe los sepultara. Con las fuerzas vivas chilenas, ayuda de paises extranjeros, y cada uno de las personas que pusieron su esfuerzo, hoy desde las entrañas de la madre tierra, renaceran, saldran a la luz para reencontrarse con sus familias, con sus conciudadanos, con un mundo entero que espera por ellos. El milagro se ha sucedido, cuando se produjo el derrumbe, pudieron llegar a la zona de resguardo que cada mina debe poseer por seguridad, donde hay alimentos, oxigeno, y pudieron sobrevivir. Quienes creemos en Dios,pensamos que su fuerza superior ayudo tanto a los rescatistas,a quienes han trabajado denodadamente para llegar a donde estaban los mineros, como a esos hombres, que han mantenido intacta su fe, su valor, que han conformado un grupo solidario sabiendo que sino lo hacian no sobrevivirian, que la fuerza estaba en la UNIDAD. Hoy las familias, un pueblo, muchos pueblos, el mundo espera por el milagro que se producira al salir esos 33 hombres que son un simbolo, el simbolo de lo que logra la fe, la esperanza, el trabajar por el bien comun, dejando de lado egoismos, deseos de atropellar al otro y solo pensar en que “juntos se puede lograr mas”, que juntos en la lucha se consigue el bien comun, ” que la unidad hace la fuerza”. Quien sea creyente, que levante una plegaria, quien no lo sea que con el pensamiento positivo, y sabiendo lo que es la empatia, ponerse en el lugar del otro, envie sus fuerzas para que este renacer, se lleve a cabo sin problemas y de la mejor forma posible. Al pueblo de chile, al pueblo boliviano, que tengan fe, que luche, y que esto sea solo el comienzo de la union de los pueblos. A las familias, que esto los una mas como familia, que esa fe, esa entrega el pasar dias y dias en el campamento esperanza, sea solo un simbolo de la union familiar, del amor familiar. 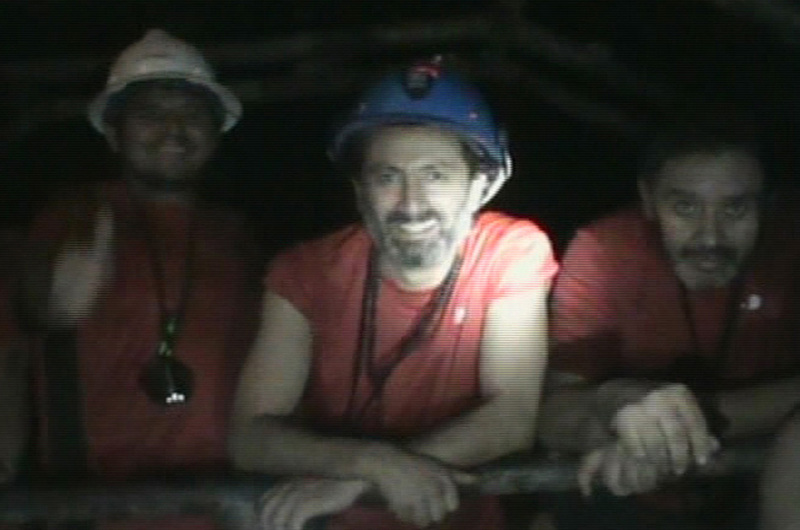 A quienes han participado de alguna u otra forma en el rescate, en trabajar denodadamente para extraer a los 33 mineros, las gracias por todo lo que han hecho, tambien el saber que el trabajador ayudando a otro trabajador logra las mayores cosas. Y que decir de esos 33 hombres, que son hombres, personas de gran valor,que han puesto lo mejor de si y no se dejaron llevar por mezquindades humanas, sino que han demostrado que el hombre aun mantiene los valores, y que en el entendido que el bien del otro es el bien propio, demostraron lo que es solidaridad, lo que es un grupo unido, y lo que logra un conjunto de hombres que en lugar de pensar en si mismos piensan en el otro. Pasan las horas y el momento se acerca, vivamos con alegria y fe estos momentos, disfrutemos del nacimiento de la madre tierra, del volver a la luz de estos 33 hombres y la historia continuara y ellos y sus familias las escribiran juntos ……. Here you have another books you can read and enjoy the literature. From the Che Guevara to Julio Verne a great number of books to choose. Maria Seona y Hector Ruiz Nuñez – la noche de los lapices – the book that the film is based on. Also the declaration of part of who live this day in La Plata Argentine during the military State situation. The work of Eduardo Galeano, has always been recognized worldwide, but due to the V Summit of the Americas, Venezuelan President Hugo Chavez gift to U.S. President Barack Obama book sales were going in the portal Amazon’s from position 60,280 to position number ten. The Open Veins of Latin America, the book of a Uruguayan writer and journalist Eduardo Galeano, there is an essay on the situation in Latin America since the European colonization of America to contemporary Latin America, arguing with narratives and chronicles, the situation is Latin America has undergone since the looting of their natural resources by colonial empires of the sixteenth and nineteenth centuries. The work was published in 1971, when it looked latinoamerica shrouded in political and ideological confrontation. In 1973, Galeano should go into exile if the situation in Uruguay, had become untenable because of the military coup. Therefore the book was censored for many years in Chile, Argentina and Uruguay itself. 2). The development is a journey that most shipwrecked sailors. In Trinidad and Tobago took place in these days the V Summit of the Americas, where the presidents of UNASUR (Union of South American Nations – comprising 12 countries Argentina, Bolivia, Brazil, Chile, Colombia, Ecuador, Guyana, Paraguay, Peru, Suriname, Uruguay and Venezuela) and heads of state of the Caribbean and Central America (total 34 heads of State) met with the president of the United States, Barack Obama. “President Obama won the willingness of Central and South America,” summarized the Honduran president, Manuel Zelaya. One of the main issues that was hit is Cuba, where the blockade established by United States for more than 4 decades, is the great heart, which was discussed at the Summit, being requested by the chairmen present to lift the embargo and Relations between Cuba and the United States can resume. The summit ended without a final declaration due to unanimous that if Cuba is excluded from international forums since 1962. Obama, in his speech that I expected signs of Raul Castro and Cuba, opening the island with respect to freedom of expression and as for political prisoners in the island. Saying that Washington has taken a step on the way to resume the dialogue between the two, referring to the enactment of the release of permits in terms of travel to Cuba without restriction and to send remittances. 4:10 a.m. Congress Boliviano allow the entry into force of the new electoral law by which the president Evo Morales has give up the hunger strike. Bolivia now have a law of transition to be of a general election in December, also allowed to vote outside of Bolivians abroad, will also be a new voter registration besides many other modifications. Apparently the pressure exerted by Evo Morales has been successful. Now whether this pressure is not a defeat for democracy itself, and far, the power of President Evo Morales, every time Congress or any political contrary, decide to be against the returns to a hunger strike and if not successful, as far as their actions. Time will tell if democracy is not weakened. 4:10 am el Congreso Boliviano permite la entrada en vigor de la nueva ley electoral por lo cual el presidente Evo Morales ha levantado la huelga de hambre.